"Greystone Park Psychiatric Hospital" February 2017 Book Giveaway ~ The History Girl! 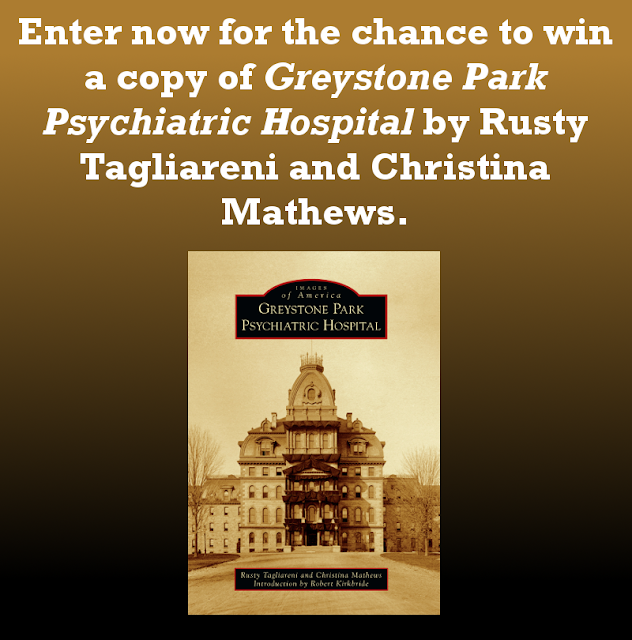 Thanks to authors Rusty Tagliareni and Christina Mathews and Arcadia Publishing, The History Girl is offering one copy of their book Greystone Park Psychiatric Hospital (Images of America). In order to be in the running, submit your name and e-mail address below! The Greystone Park Psychiatric Hospital was more than a building; it embodied an entire era of uniquely American history, from the unparalleled humanitarian efforts of Dorothea Dix to the revolutionary architectural concepts of Thomas Story Kirkbride. After well over a century of service, Greystone was left abandoned in 2008. From the time it closed until its demolition in 2015, Greystone became the focal point of a passionate preservation effort that drew national attention and served to spark the public’s interest in historical asylum preservation. Many of the images contained in this book were rescued from the basement of Greystone in 2002 and have never been seen by the public. They appear courtesy of the Morris Plains Museum and its staff, who spent many hours digitally archiving the photographs so that future generations may better know Greystone’s history. *One entry per person. *Valid for all residents of the 50 United States of America, 13 years of age or older. *Entries without a valid e-mail address are not eligible. *Contest begins February 5, 2017 at 6:00 pm EST and ends February 11, 2017 at 8:00 pm EST. *The winner will be chosen at random. *The winner will be notified via e-mail on February 11, 2017 after 8:00 pm. The winner must respond with a mailing address within thirty-six (36) hours or another winner will be chosen. grandpop was committed in 1937 and went through unbelievably harsh insulin shock therapy. looking at letters, we now believe he was only bi-polar. how sad. Work right down the street from here. Used to go in there at night when I was a kid.